Overworked, mistreated and underappreciated? Think you’re the only one with a right to complain? Think again. Mira Katbamna reveals 10 things your boss hates about you. The result of all this is that while your boss might look like she’s fine, inside she’s seething. You think you hate your boss? Here are the top 10 things your boss hates about YOU. Usually two or more people come together for the purpose of discussing a topic. It is important method used by us for communication, marketing and much more. The research appears in this month’s issue of the Journal of Consumer Research which suggest that – Brainstorming sessions backfire when group thinking clouds decisions. According to wikipedia, Chimpanzee, often shortened to chimp, is the common name for the two extant species in the genus Pan. The better known chimpanzee is Pan troglodytes, the Common Chimpanzee, living primarily in West, and Central Africa. Its cousin, the Bonobo or “Pygmy Chimpanzee” as it is known archaically, Pan paniscus, is found in the forests of the Democratic Republic of the Congo. The Congo River forms the boundary between the two species. According to this news story for first time, chimps seen making weapons for hunting apart from humans. It is the first time that an animal other than a human has been directly observed in crafting a weapon for the purpose of hunting or killing. So basically history is repeating itself. We did some things millions of years ago. Through January 31, over two-dozen Brainbench certifications are available to you at no cost! Typically $49.95, these tests are available to you absolutely free! Upgrade your resume – impress your boss – show off to your friends – and it will cost you nothing but your own time investment. Media is making big news about Shilpa Shetty. She is abused on Big Brother reality show and Bollywood is protesting against Channel 4. Channel 4 and TV regulator Ofcom have had more than 21,000 complaints about treatment of Shetty. Other contestants have made fun of the A-list Bollywood actress’s name, her eating habits and her Indian background. She was called a “dog”. In Indian society educated people don’t use word “dog” for women. However according to the BBC news, Channel 4 has denied claims that Celebrity Big Brother contestant Shilpa Shetty has suffered racist bullying. There had been a “cultural and class clash” between three other housemates and the Indian star, the channel said. According to Shetty’s mother, Sunanda – “Her daughter was tough and she would be able to handle the situation.“. I haven’t seen the show so I can’t comment more here. Or is it a publicity stunt? What do you think? The lion (Panthera leo) is a mammal of the family Felidae and one of four “big cats” in the genus Panthera. The lion is the second largest feline species, after the tiger. 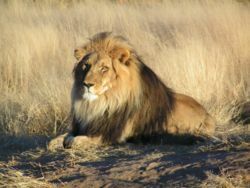 The male lion, easily recognized by his mane, weighs between 150â€“250 kg (330â€“500 lb). Females range 120â€“150 kg (260â€“330 lb). In the wild, lions live for around 10â€“14 years, while in captivity they can live over 20 years. Though they were once found throughout much of Africa, Asia and Europe, lions presently exist in the wild only in Africa and India. They enjoy hot climates, and hunt in groups. Female lions usually hunt at night or dawn and in packs. Their prey consists mainly of large mammals, such as antelopes, gazelles, warthogs, wildebeest, buffalos and zebras, but smaller animals like hares and birds are also taken occasionally. Carrion is readily taken and often recovered from other predators like hyenas and wild dogs. In some areas, lions specialise on rather atypical prey-species; this is the case at the Savuti river, where they constantly prey on young elephants, and at the Linyanti, where they hunt hippos. An adult female lion needs about 5 kg (11 lbs) of meat per day, a male about 7 kg (15 lbs). => This article includes information from wikipedia article Lion.